On the cusp of inheriting his father's estate, Swanson (Tim Heidecker, "Tim & Eric Awesome Show, Great Job!") is a man with unlimited options. An aging hipster in Brooklyn, he spends his days in aimless recreation with like-minded friends (“Tim & Eric” co-star Eric Wareheim, LCD Soundsystem frontman James Murphy and comedian Gregg Turkington a.k.a.“Neil Hamburger”) in games of comic irreverence and mock sincerity. As Swanson grows restless of the safety a sheltered life offers him, he tests the limits of acceptable behavior, pushing the envelope in every way he can. 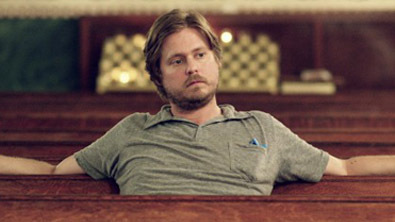 Played brilliantly by Heidecker, his deadpan delivery cleverly masks a deep desire for connection and sense in the modern world. THE COMEDY wears its name on its sleeve, but director Rick Alverson's powerful and provocative character study touches a darkness behind the humor that resonates with viewers long after the story ends. Rick Alverson (b. 1971) is a filmmaker and musician from Richmond, Virginia. His previous films include The Builder (2010), an existential character study of an Irish immigrant at odds with the promise of America. New Jerusalem (2011), starring Colm O’Leary (The Builder) and Will Oldham (Matewan, Old Joy), again considered the immigrant experience but this time through the lens of religious ideology. New Jerusalem premiered at the 40th International Film Festival Rotterdam and SXSW in 2011. Also in 2011, he was awarded a Visual Arts Fellowship from the Virginia Museum of Fine Arts. He also has directed videos for Bonny Prince Billy (New Wonder) and Gregor Samsa (Jeroen Van Aken). Upcoming films include a reconstruction era drama entitled Clement, to be produced in 2012, and Rabbit, both of which continue his collaboration with Colm O’Leary. 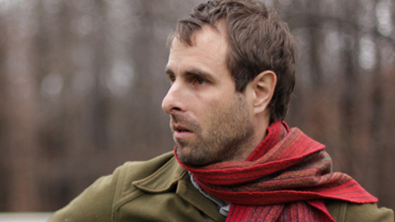 In addition to his directorial work he has released 9 records on Jagjaguwar, most recently with his band Spokane in 2007. Each of my previous movies, The Builder (2010) and New Jerusalem (2011) scrutinized the utopianism at the root of American culture and the often great disconnect between people and their ideas. That disconnect is essential to my interest in movies - that gap between a perceived world and an actual material place. It provides me with both a general skepticism of the usefulness of cinema and a sense of it’s potential. The Comedy takes that scrutiny of American culture, and its influence on global culture (under the promise of the free market), a step further. Much of the film was shot in and around Williamsburg and Greenpoint, Brooklyn. The first seemed indicative of a kind of progressive American exceptionalism, a bastion of the cultural elite, just past its prime and already in that strange state of monochromatic gentrification much like the group of privileged, aging hipsters at the center of the film. The second, Greenpoint, offered an intersection between immigrant culture and that young, burgeoning class of white, suburban ex-patriots. That collision of individuals for whom the American Dream has been achieved and become tepid, as dreams often do, and those for whom it is yet a form of sustenance, more emotional than physical, is a pivotal focus of the film. The group of men at the center of The Comedy seemed an inevitable byproduct of the utopian dream come to fruition, ignorant or oblivious to the precarious state of world affairs, the economic uncertainty of their own country and the stagnation of the culture in which they may live. They struck me as inherently sad characters, joyful in their bubble, as sympathetic as they are reprehensible, living in a progressively malignant social paradise where options and good fortune breed a desensitized indifference and recreational cruelty. They pacify their discontents with strange meta-mock sincerity and irreverence, as though humor itself were dying or dead and had nothing left to do but turn on itself. Swanson, the protagonist, finds himself strangely at odds with the good life. We watch him take what may be the first decisive, yet idiosyncratic, steps in his privileged life--a strange flirtation with reality, a creative motion full of the ambiguous desire to be annihilated or embraced. With that action the film enters a voyeuristic arena, where both Swanson’s voyeurism and our own become, for me, the movie’s driving force. As opposed to engendering the protagonist with sympathetic attributes, my interest was to link the audience and the protagonist through their mutual desire for emotional animation and sensitization. For me the audience, the viewer, and Swanson are in the same predicament, are driven by the same conflicting set of desires. I am ultimately interested in the denial of those hopes, for the resolve of his annihilation (emotional or physical) or the satisfaction and relief of his salvation. I think that middle ground is the state in which we most often live and one from which the audience and Swanson both desire to flee, one that is denied its due in entertainment and even the grand drama of many of the arts. Ultimately there is a game at hand in the form of the film, an attempt to bait both Swanson and the audience into a reckoning with the muddy, nuanced, uneven ambiguity of life that is digested most wholly when the caches are cleared and the compartmentalization set aside. Swanson’s inadvertent need for meaning as utility – for his hands and body to make sense in the world in a fundamental way, touches on the crisis of modernity. He has been divorced from that simple understanding, whether it be rosy or horrific, of a body’s sense in the world, of its literal use, both by his family’s good fortune and his country’s, in the way so many of us have lost that sense--divorced from labor, localism and basic intimacy.